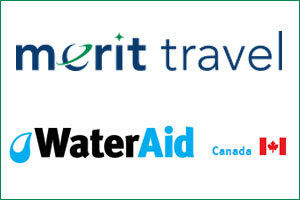 In celebration of World Water Day, Merit Travel Group is expanding its partnership with international non-profit organization WaterAid Canada as part of a nation-wide fundraising initiative. A unique online fundraiser auction, the Auction 4 Action — https://merittravel.com/auction4action/ — spearheaded by Merit Travel opens March 22, offering an array of exclusive travel rewards, going towards helping support WaterAid’s Tanzania: Deliver Life Program. Merit Travel’s efforts will serve to improve child health through the provision of water and sanitation services at 12 obstetric and neonatal care clinics across rural Tanzania, Africa. Through an ongoing commitment, Merit Travel Group raised $86,000 in 2018 alone and over $200,000 during the course of its partnership with WaterAid Canada to date. The travel company has assisted in the successful ongoing support of WaterAid’s initiatives in Tanzania to create new infrastructure, the commissioning of biomedical waste facilities and tools at all 12 clinics, and in building the capacity of health care workers.